It was a resounding 'no' to Israeli Prime Minister Benjamin Netanyahu's request for the European Union to follow the US lead and recognise Jerusalem as the capital of Israel. 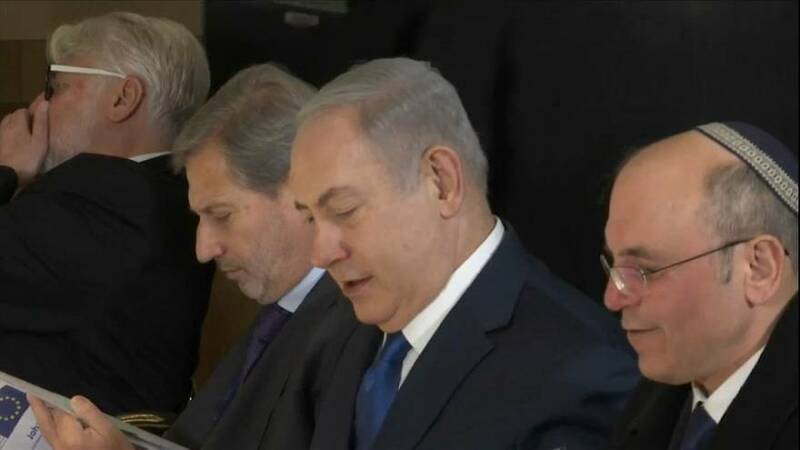 After a breakfast meeting between Netanyahu and EU foreign ministers, it was revealed that no country had voiced support for the US move. But Mr Netanyahu said it was a recognition of "reality". "There is now an effort underway to bring forward a new peace proposal by the US administration," he said. "I think we should give peace a chance. And it's time that the Palestinians recognise the Jewish state and also recognise the fact that it has a capital that is called Jerusalem." The EU's foreign policy chief Federica Mogherini said the EU would continue to recognise the international consensus on Jerusalem. "There is no initiative, no peace initiative, no attempt to restart peace talks between the Israelis and the Palestinians that can happen without engagements from the US," she said. "But there can be no illusion from the US side that the US initiative alone would be successful." Mogherini repeated the Union's commitment to a two-state solution adding it was in Israel's interest to find a sustainable solution to its conflict with the Palestinians.